My husband and I recently met a spectacular couple, a genuine cowgirl and cowboy. Besides being fortunate enough to purchase a very sweet horse from them, we are proud to be able to call them our friends. While at their home I learned that her one of her best friends, her horse, had passed away the previous year. "Yoda" had carried her though years on the Rainbow Riders drill flag team, taken her to reigning championships, and safety along countless miles of trails. I wanted to do something special for her, and also try something new for me. 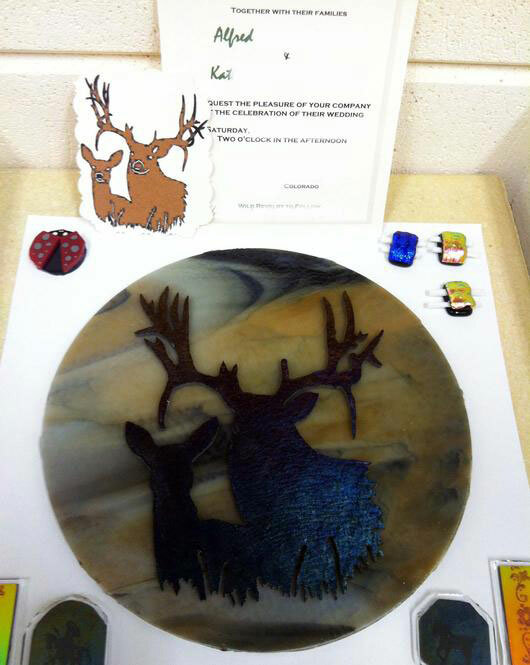 I remembered seeing an article in the Delphi newsletter about making fused glass silhouettes from a photograph. While at her home I snuck a picture of her and Yoda sliding to victory, on my cell phone. I downloaded the picture and adjusted it to an appropriate size for a 10 by 10 square plate mold from Delphi. I cut out the image and traced it onto my black iridized COE 90 glass. 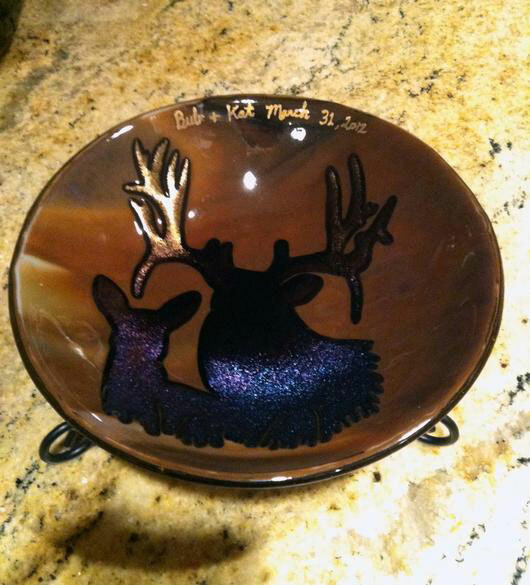 I used amber streakies and amber clear COE 90 glass, behind the silhouette and border, to thicken the plate with color. I traced my silhouette and began cutting it out with my Taurus 3 Glass Ring Saw. I don't have the special separator blade for the saw, to cut out pieces within my image, so I traced a piece of the background glass and laid it into the spot where I wanted to create a hollow area (between the reins and saddle). 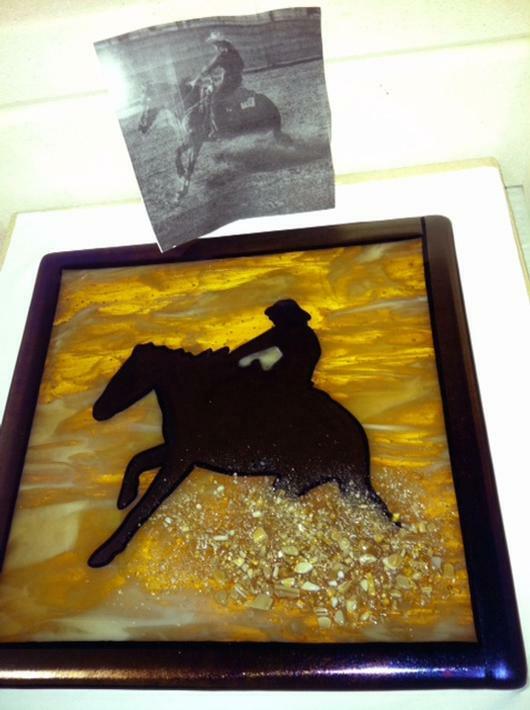 I tried crushed up some glass to make the large plume of dirt I needed to depict the horse sliding, and decided to try a tack fuse to make the dust cloud really opaque. When I gave my friend this plate she was speechless, and the next time I went to her home it was on display by the photo of her beloved Yoda. It made me proud, not of the plate, but that glass can bring folks together, and preserve a precious memory for any friend. The other project shown here (bottom left) was inspired by a wedding invitation.